Most physical realisations of quantum computers that have been suggested to date cannot be realised with current technology. The major exception is nulcear magnetic resonance. We use liquid-state NMR to implement various quantum algorithms and to simulate quantum systems on an NMR quantum computer. This system allows very precise control of the evolution of the quantum system and a large amount of fleibility in choosing the quantum system that is best suited for a given task. In addition, we also use solid-state nuclear magnetic resonance. The dipolar couplings that are present in these systems allow one to combine many spins into a quantum register with several thousand qubits. Using this system, we could show that quantum mechanical superposition states decay at a rate that increases with the square root of the number of qubits in the system. 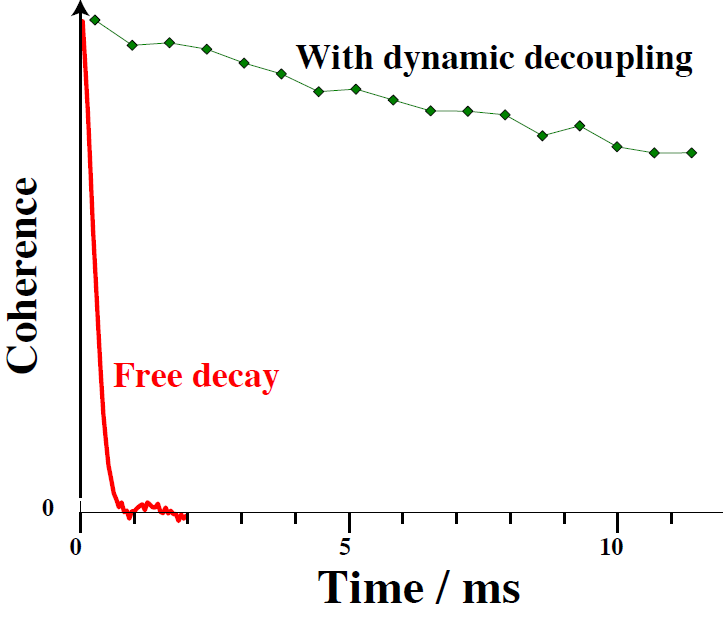 Furthermore, it turned out to be possible to reduce the decoherence rate by modulating the system-environment interaction in a suitable way. This allowed us to reduce the decoherence rate by almost two orders of magnitude. 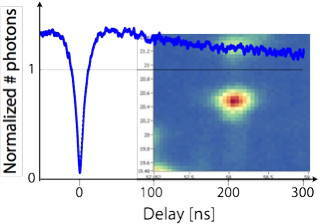 Solid-state NMR also allows us to simulate quantum systems. As an example, the figures on the right hand side show the effect of disorder on the spreading of information: Starting from individual spins, an appropriate Hamiltonian can spread quantum information to arbitrarily large systems, as shown in the experimental data in the upper panel. With increasing perturbation, this spreading stops and we observe a quasi-equilibrium of the system (see lower panel). The size of this stationary state (in terms of spatial extent or number of correlated spins) decreases with the strength of the perturbation. The result can be described as a localization-delocalization phase transition. The scientific community is currently exploring many different physical implementations of quantum information processing. The main common feature of all these implementations is that the lifetime of the quantum information is too short to allow large-scale computation. The decay of the quantum states arises from the unavoidable interaction between the quantum system and its environment. A possible remedy for this issue consists in applying sequences of pi-rotations to the qubits, which are designed to make the interaction between system and environment time-dependent, such that its average value vanishes. We have experimentally compared several proposed sequences, using a simple quantum computer based on nuclear spins. We could show that the concept works and that it allows one to extend the lifetime of qubits by many orders of magnitude. We could also show that for practical implementations, the imperfections of experimentally possible rotations can cause more damage than the environment. We therefore designed sequences of rotations around different axes where the pulse imperfections do not add over the sequence, but actually cancel. The resulting sequences are thus robust against imperfections and provide optimal decoupling over a wide range of parameters. Large-scale universal quantum computing requires a mechanism for the elimination of errors, which arise from unwanted interactions with the environment as well as from the finite precision of experimentally realizable control operations. Quantum error correction (QEC) achieves this in a similar way as classical error correction: the information of a logical qubit is encoded in multiple physical qubits. At regular intervals, the system state is checked for possible errors and they are corrected. We have implemented an error correction code that is able to correct all possible single-qubit errors and combined this protection scheme with logical gate operations on the encoded qubit. The experimental data show that this scheme increases the overall fidelity of the gate operations. The nitrogen-vacancy (NV)-center of diamond has almost ideal properties for testing basic concepts of quantum information processing on single particles (electron- and nuclear spins). We design quantum gate operations and test dynamical decoupling schemes, which extend the coherence time of the electron spin almost to the T1-limit (~4 ms). Combining the electron spin with the nuclear spin degrees of freedom of nitrogen (14N) and carbon (13C) nuclei allows one to implement simple quantum computing devices with 2-5 qubits.